You must have read the post on "Awesome Entryways" on my blog earlier. On a quest to make my home's entryway interesting and awesome, I did a simple makeover. This is the very first makeover of my place lot more will follow soon. Let's first have a look at before and after images of the entrance to my home. 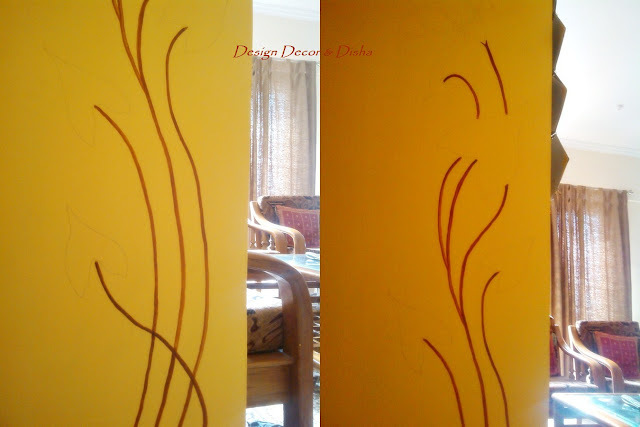 A plain, dull and stark wall on the left and a bright, beautiful, inviting and welcoming wall on the right. Don't you agree? I always strive to add some personal touches in my home. I am on a mission to fill colors in my home (my blank canvas) and I started it from the foyer. 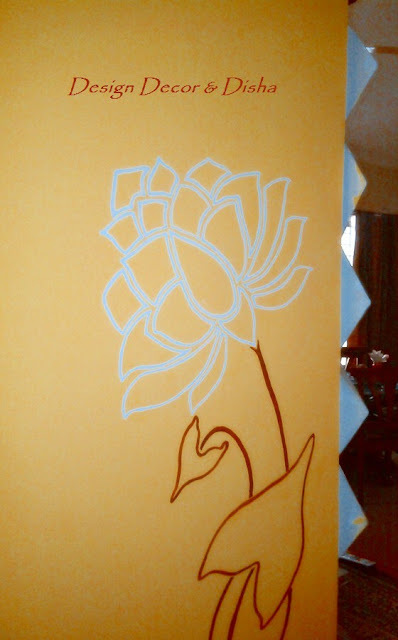 First, I thought of stenciling the wall and one more idea was to draw a free hand design and then paint it. So just for a rough idea, I came up with these two designs. 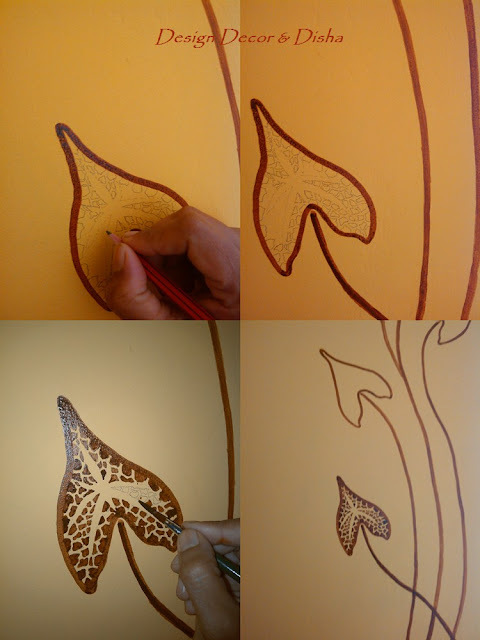 Sent these images to my sister and she loved the idea of the freehand design . 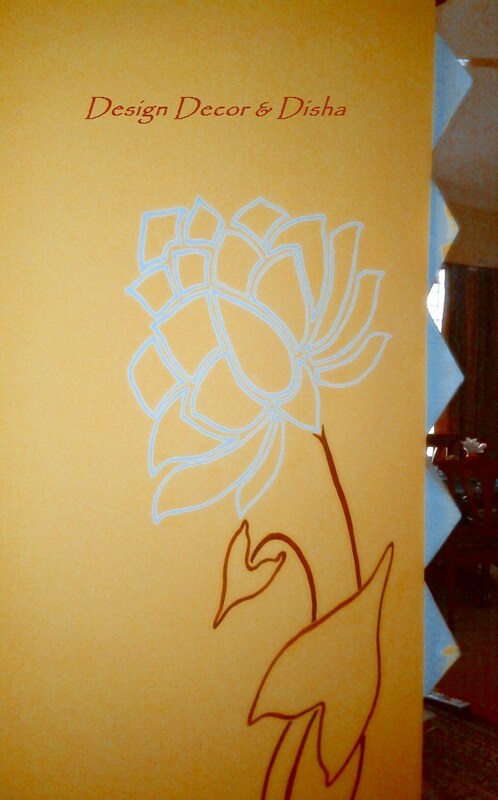 Then I drew a freehand design on the wall and started filling brown color in it. Though it was a freehand design I wanted to give it a look of a stencil. For Lotus, I was confused between white and red color. Then decided to go with white. Here's a look after filling color but my hands were itching to do more. I filled gold acrylic color in leaves' veins and it looked perfect. It shines when light falls on it and make it look more interesting. Here comes the complete look. Look that gave me full satisfaction. It turned out far better than my imagination. 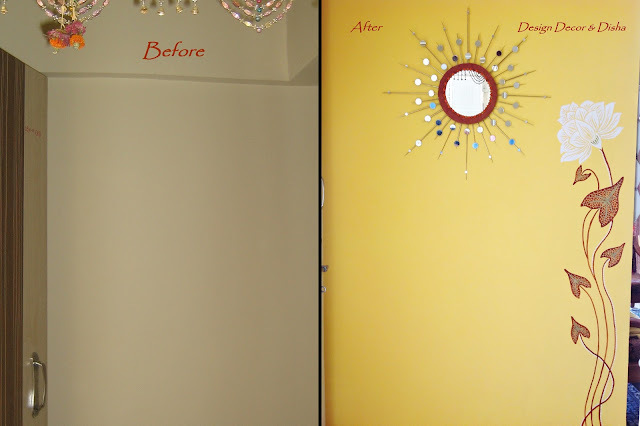 And here I wanted to let all my friends know that this sunburst mirror is also my creation and I created it in only 3hrs because I was in a hurry to complete this wall as soon as possible (Sometimes I become so impatient). It feels great, wonderful, amazing when you see your own creations everywhere around your dwelling. Loved my blog, then probably you don't want to miss any update, here are the links to my social media platforms where I share home decor tips and beautiful images regularly. See you there!! wow Disha..way to go girls!! @Sudha: Thank you!! So sweet of you. @Sarmistha: you made my day girl. Sending you mail right now. Lovely artwork Disha. Awesome color !! 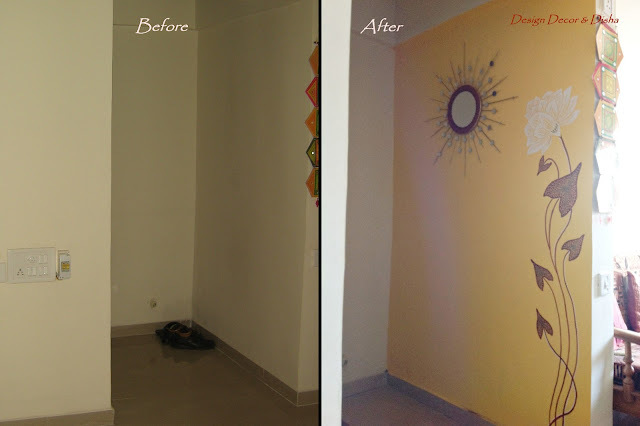 The wall looks truly amazing Disha and nice to see your little one too involved in the project. The sunburst mirror too looks great!! @Diya: Thank you Diya. Loved your blog totally!! 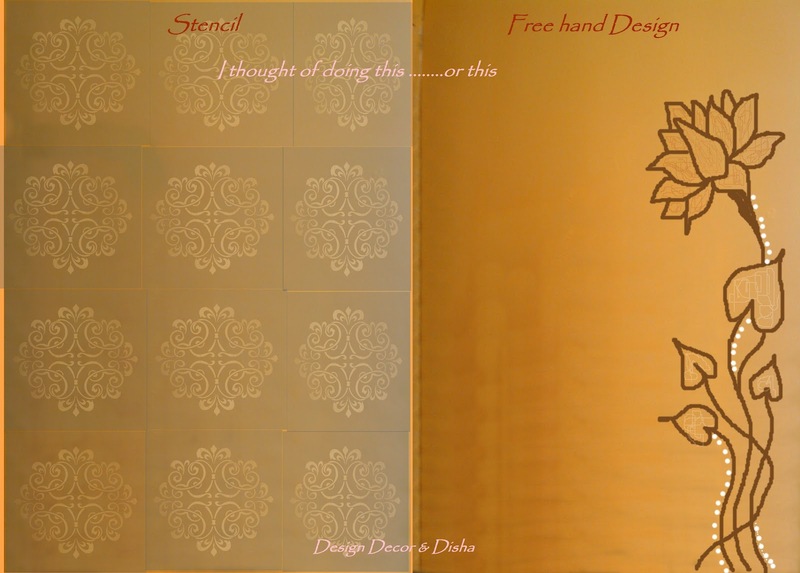 @vandana craftsia: Thanks Vandana, little one is always there to help me in each and every work. Thanks for dropping by. @Somu @ Woodooz: Thanks Somu, Thanks a lot for leaving such a wonderful comment. 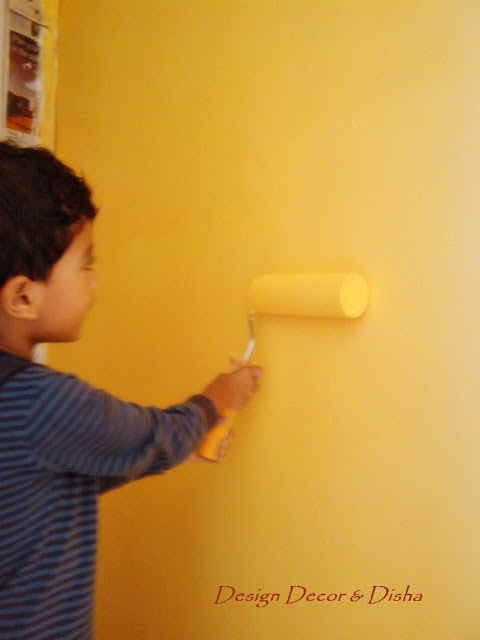 Earlier I too was very scared of painting a wall but one day I just decided and painted it and result is here. Came here from Colours Decor feature. Loved the sun burst mirror (I'm a total sucker for those, right now making one of my own) and the wall art. Now all that space needs is a foyer table. Reading through the rest of your blog. Omg..i love the wall art and the mirror is tooo beautiful!! 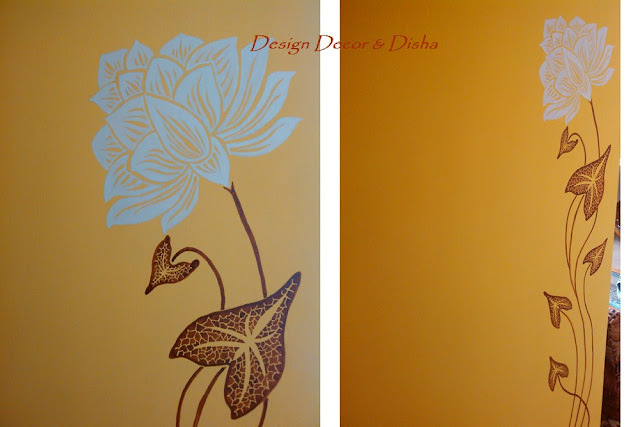 Hi Disha,Your wall looks really good,I love your creations. Hi, I came over from Colors Dekor and just loved this wall makeover. I am stunned to know that you've done free hand painting. I honestly thought it was a stencil. Awesome.